Scrolling through my Instagram timeline, I came across a side by side comparison photo. On the left was a picture of Lauryn Hill embracing Erykah Badu, and the right side was a still from Beyoncé and Nicki Minaj’s recent ‘Feelin’ Myself’ video. The caption under the photo expressed that women who felt the left side closely represented the manner in which they carried themselves were superior to those who identify with the right. This was a conflicting claim for me to accept. 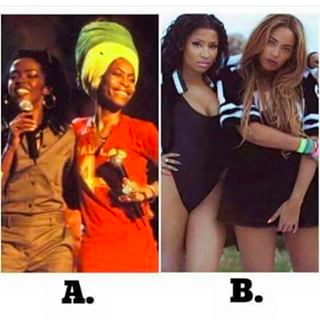 When I think of Lauryn Hill, Erykah Badu, Beyoncé, and Nicki Minaj, I see four careefree, Black women. While they don’t represent ALL Black women, they’re examples of the various body shapes, shades, hair textures, personalities, and sexual orientations we come in. None of these women present themselves to be superior to the other. They all have their own strengths and weaknesses, as we all do. I will safely assume that being Beyoncé and Nicki Minaj have openly embraced their sexuality through their art and physical appearance, some will see them as “less pure” than the Lauryn Hill’s and Erykah Badu’s of the world. Unhealthy competition amongst women is often a result of how society constantly compares us. Every day women are judged off of their physical appearance, being told what an acceptable form of beauty is and to what degree we can embrace our sexuality. At times, this factors in how we see our own beauty and bodies, as well as, how comfortable we are with our own abilities. I’m here to tell you that one person’s beauty or talent doesn’t make you any less beautiful or talented. This is also true for the different forms of beauty that Black women possess. True beauty is when you can look in the mirror and love everything you see, not because someone told you that you’re acceptable or wanted, but because you LOVE your reflection and who you are. 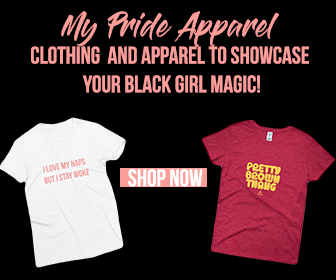 Currently, Black women are in a process of rebuilding a broken psyche that was convinced that they were not beautiful or wanted (until it becomes a trend of those who lack melanin.) We are working everyday to free ourselves from the standards of others. I will argue that this must start internally. While Black women redefine beauty, we can’t rely solely on the physical. Beauty is spreading positivity. Beauty is uplifting one’s community. When looking into the actions of Beyoncé, Nicki Minaj, Lauryn Hill, and Erykah Badu, they have all done this. Four Black women with various physical appearances have all consistently stood for the same goals, such as, female empowerment and community outreach. Once women search for each other’s internal beauty it will begin to show physically. There will be a wave of happiness, smiles, and support amongst us all. We can not make anyone feel less than for the external if they genuinely see worth in every part of their being. Remember, the only rules for being a carefree, Black girl are 1.) Be carefree 2.) Be a Black girl. 1 Comment on "The Competition of Being a Carefree Black Girl"
Thank you so much for this. We all need to hear this.